I got the title of Lord for my best friend for his birthday, and it was the perfect gift. I can’t express how happy and surprised he was to receive it. Very high quality and nice packaging. I plan on ordering more titles for friends very soon! I got the Barony package with ID and land. The turnaround was much faster than I expected going to the U.S. It truly is a fun, well done ensemble, and contains everything promised. I highly recommend it if you are looking for something along these lines. Thank you for the prompt and excellent service in making me a lord, at last people will call me sir without adding “you’re making a scene”. Magnifique titre de noblesse, papier de qualité, le tout accompagné d’un sympathique dossier contenant informations, photos de Sealand ainsi que les règlements du titre. La grande classe ! The primary way to consider yourself associated with Sealand, the title package is quite wonderful. I highly recommend the premium package, as the frame and the signature from Prince Michael really tie it all together. I want to express my excitement and gratitude to Sealand. I have received my title of Lady today, August 28th, and it is truly a dream come true. I have wanted a noble title since I was a child. It took 10 days for the papers to come from Europe to America. 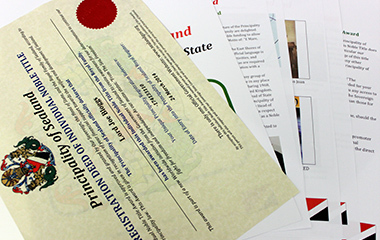 The papers are very official with the seal stamped next to your stated name and title. Again, thank you Sealand for the wonderful service. I would like to thank you for my very own registration deed I recieved yesterday. The order was delivered in just 5 days to Czech Republic in perfect condition. Thank you for the great service and I wish you good luck. 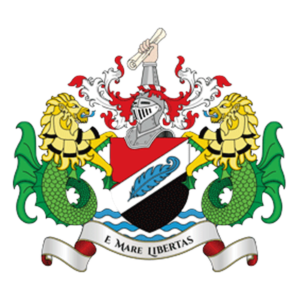 Meus parabéns Família Real de Sealand, O Príncipe Roy Bates realizou o seu sonho; agora são vocês que realizam o sonho de outros. Vida longa para Família Real. I never knew being a baron in a country far from where I live would look good in my resume. Now wherever I go, I found people bowing and kowtowing to me.. 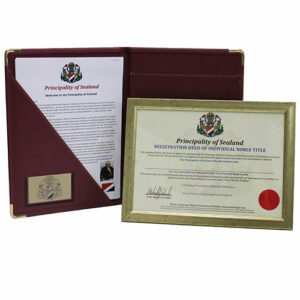 The noble act of citizenship is signed by Prince Michael, the title is with parchment paper with sharp print with Tibro made of sealing wax in a frame color gold. 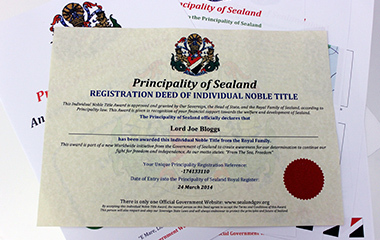 Together I have received all the documents and the history of Sealand and within a week from the package arrives. 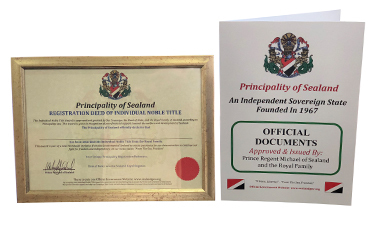 For me it is a great honor to have the citizenship of the Principality of Sealand. It’s an amazing item that my girlfriend and I bought : documents are interesting and the deed has a high quality. 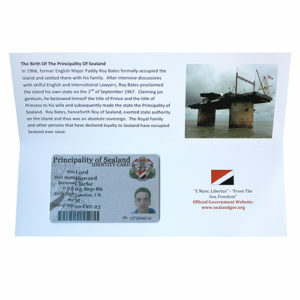 We recommend this gift to anyone who is interesting in the Principality of Sealand. And the shipping to France was very fast ; we bought it on monday night, we received it on Saturday. It is completely legit, as I researched international law on the subject. I am happy to say that Lord J’s Wife is (respectfully) mistaken. Article I, Section 9, Clause 8 of the U.S. constitution states that no U.S. citizen can be granted nobility by the U.S. Government, nor shall any government official be granted one by any foreign state. to quote directly: “No Title of Nobility shall be granted by the United States: And no Person holding any Office of Profit or Trust under them, shall, without the Consent of the Congress, accept of any present, Emolument, Office, or Title, of any kind whatever, from any King, Prince, or foreign State.” So, this is a 100% legitimate title of nobility; and it is legal. 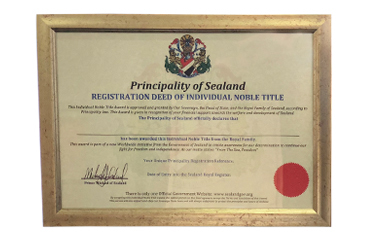 I ordered a honourary Baron title from the Principality of Sealand and it arrived very promptly within one week of order. 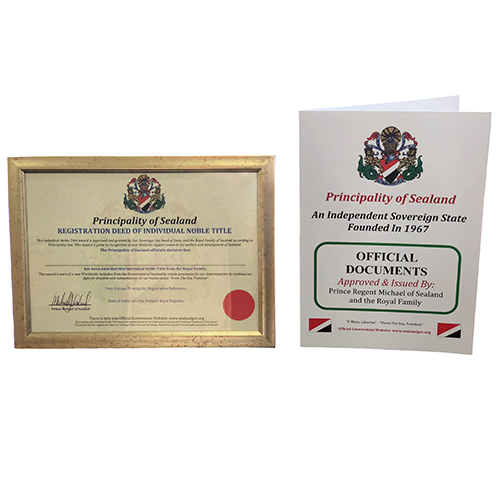 The certificate or registration deed is printed on nice parchment type paper, with nice sharp print with an embossed logo of Sealands Coat of Arms. Improvements? Cotton paper with a genuine wax seal would be awesome. E-mail responses would be nice too but no complaints here, pleased with service and speed of delivery. Got my Lady title today, very fast delivery and look awesome. I love Sealand! will buy some more titles for my family members for their birthday as a cool present/surprise for sure. I purchased a title earlier this month and was highly impressed with the swift delivery (especially considering that I live right across the other side of the world)! It took about five business days to arrive which was even less than anticipated. 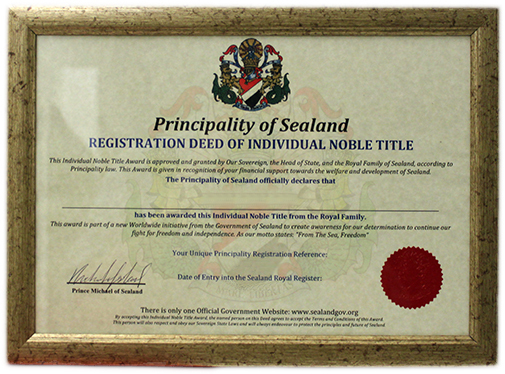 The Principality was also kind enough to send me a PDF document confirming the granting of my title right away, so I didn’t have to wait for my documents to arrive to begin using my noble title officially. 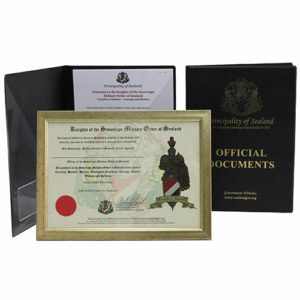 The deed itself is an exquisitely designed parchment sealed with the official stamp of the Principality. I will continue to express my support for the Principality of Sealand throughout its existence and look forward to witnesses its progress! We bought this for my husband for Father’s Day 2012. We purchased the £29.99 package. It was nicely printed and assembled in a presentation folder, and the certificate looks great in a frame I purchased. The package arrived very promptly. We’re purchasing another lordship for our son as a graduation gift. I anticipate great fun for him in introducing himself as a lord in the university dorms! I’ve seen a few debates elsewhere about how “legit” this is. What nonsense! First, this is exactly what it says it is, and there is no deception involved. We are extremely happy with our purchase. Second, those whom I’ve seen debate this tend to be Americans. Please be aware that the United States Constitution (Article I, Section 9, Clause 8) forbids American citizens from holding titles of nobility. So whether your lordship is purchased from Sealand or award by Her Majesty, Queen Elizabeth II, it will be entirely honorary if you are an American. Enjoy this for what it is. It’s fun, a great product, and I think that the royal family of Sealand are brilliant for having thought of this delightful product as a way to support and raise awareness for Sealand. My graduating class purchased the Baroness title for our history teacher and she loved it. My order ended up getting lost in the mail during the holidays but I emailed the store and they responded quickly sending me a new copy. I received it in the mail only a few days later with standard shipping. Everything was handled quickly and professionally and the title is great for anyone interested in this sort of thing. I bought the pack and it was handled quite professionaly. This is a very nice idea and I support this initiative. My husband bought me a Lady Title and a Tiara from Bespoke-Brides.co.uk for my Wedding day. Muy interesante, me gustaría por recibir mayor información y, luego poder colaborar en el Principado.